Saskatchewan is a prairie province in Canada with 651,900 square kms. Saskatchewan is bordered on the west with Alberta, north by the Northwest Territories, on the east by Manitoba and on the south by the United States specifically with Montana and North Dakota. It was the trailer that gave rise to the name semi truck. Since the trailer has no front wheels and can be used only when connected to the tractor part of the truck, it's called a semi-trailer. The terms "semi" and "semi truck" evolved from that. If you are looking to ship your truck in Saskatoon, Regina, Swift Current, North Battleford, Yorkton and Moose Jaw or anywhere in Saskatchewan we can provide you with a Door to Door auto shipping service or Terminal to Terminal car transport service. SHIP MY RIDE is a car carrier company based in Calgary Alberta with several years of experience. 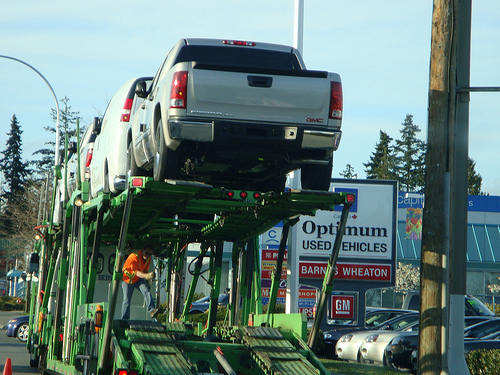 We are a certified vehicle transportation company by the Auto Transport Association since 2009. If you have any questions about our car transport services specifically or just want to know more about auto shipping in Canada and the United States you can contact us via email or phone. Whether you are shipping your truck for vacations, business, because you bought it or simply need it in another city SHIP MY RIDE can facilitate its transportation. Vehicle shipping is what we do, we do this every day. You can trust SHIP MY RIDE with your vehicle and rest assure we work to provide you with the best auto shipping experience.